By Vladana on March 26, 2019. Filed under: e-commerce, membership, woocommerce. Let’s face it – the world is crowded with smart and successful businesses. Yet, getting your business there and reaching that point is intimidating, whether you are just starting or struggling to kick your business off the ground. Your vision and idea shouldn’t get lost. For that, you need a crowd. Still, you can’t get a crowd overnight or buy it. You have to leverage your skills, be useful and helpful to people following you, and in that way build your authority. Once you have people you have contributed to improving their lives that are trusting you, you have to keep improving yourself for them and generate even more solutions to reward them for their loyalty. It is only then that you can expect a steady revenue and bring stability to your income. Whether you are selling your knowledge in a form of a blog and e-books for the most loyal followers, or selling an actual product that these people have the use for and trust your brand, with that WordPress website you are having right now you are not doing yourself much of a favour. Truth is, while WordPress is supporting you beautifully, for both your blog or WooCommerce site, it is a bit flawed from scratch. Yes, you can log in as an admin or see it as a visitor, but it has no mechanism for distinguishing your users the same way. Those “just looking” visitors are getting the same stuff as your loyal customers, same prices, and the same opportunities. You want to have these people signed in as members. Even though WordPress is not created for this, it is still doable. There is a plugin that will help you get the most out of your website for both your users and you, and it is called Paid Member Subscriptions. What is the Paid Member Subscription? 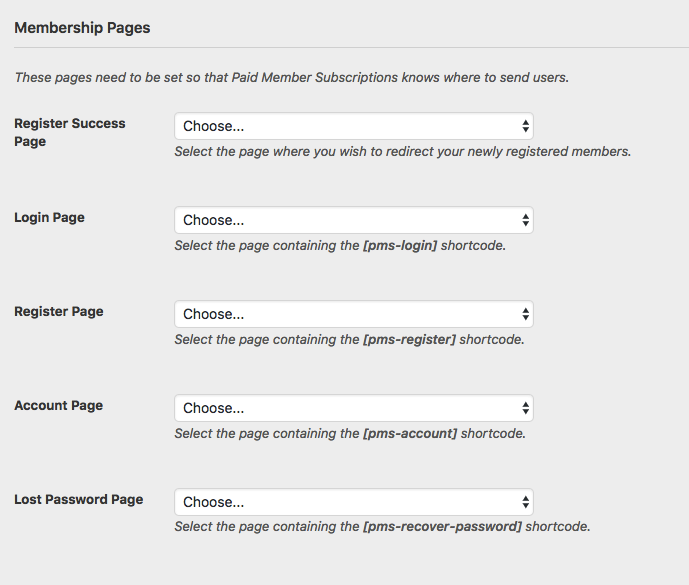 Paid Member Subscription is a WordPress plugin that makes up for the initial lack of this option in WordPress. With this plugin, you can turn your website into a membership site without thinking too much about it. Use this plugin to create and manage users, content restrictions. There is so much more you can do with available add-ons. 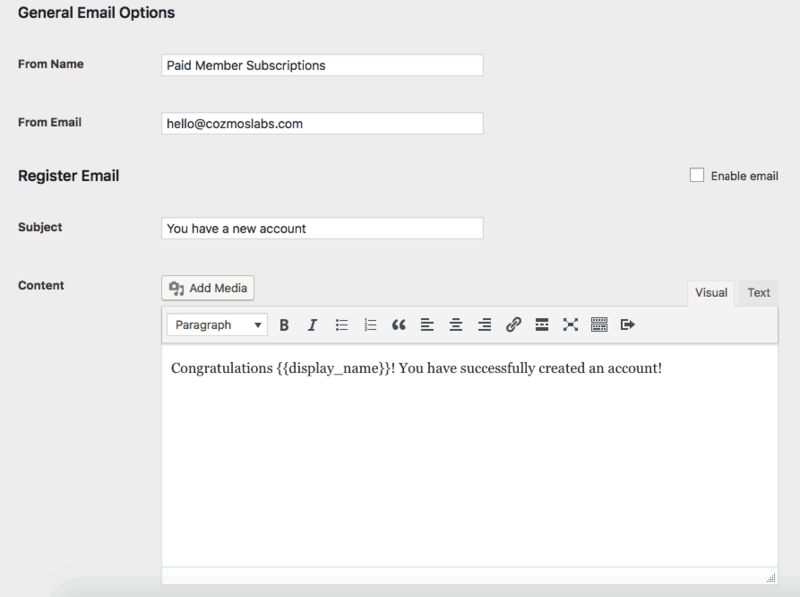 For example, this plugin integrates beautifully not just with WordPress, but with Profile Builder, to help you customize the sign-up forms, add custom fields to it, or add the email verification for an additional level of seriousness to your business. Great and most welcomed integration is definitely the one with WooCommerce, as it allows you to manage in detail who can see and buy what, and of course, at what price. Not everyone should get a special discount, and some offers should be made only to the most loyal customers. If you were looking for this solution and felt disappointed by other options, follow this tutorial to find out how you can effortlessly sign-up your users and streamline your business’ progress. Easy. Just follow the tutorial below, and get your membership site up and running in no time. You want to download and install the plugin. For this, there are two membership options available. Go in as a hobbyist if you need to get something done on a single website, or head on to the PRO version for additional functionalities and multiple websites available. Once you are happy with this plugin, you can also head out and get an unlimited license. You want to start it off by creating your subscription plans. 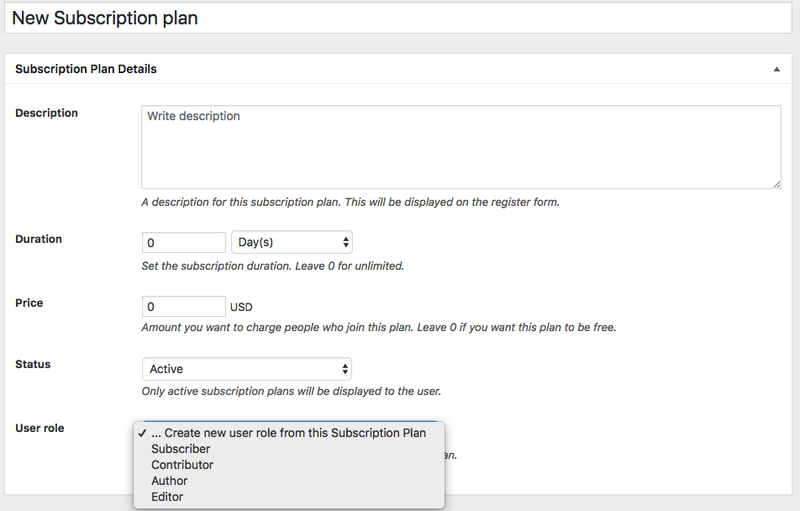 First, consider the name and the description for the subscription plan as this is going to be what the user will see. You should form your offer in a way that seems irresistible. As you can see on the screenshot, while creating your subscription plans you can set the duration, price, and the status of the subscription plan. By not tweaking the duration and the price, you are creating an unlimited and free subscription plan. Now it is time to associate subscription plans with usernames. The good news about this step is that you can add new users to a subscription plan in bulk, so you don’t have to check a bunch of boxes in a sudden splurge of new users. The screenshot is the one of adding a single user. To demonstrate, you can choose a start and expiration date, change the status and much more under the same tab. Depending on the subscription, you want to send your users to a specific location. You can find these settings to tweak under the settings tab. Depending on what your users need or go with, you have to be able to redirect them accordingly. Use the shortcodes in the right pages, and set this aspect up, so that your users end up where you want them to end up. Even though WordPress is all about openness for everyone, you don’t want everyone to be able to read your content or purchase something from your WooCommerce on a lower price reserved for loyal customers. At this point, you should be setting up the restrictions. With Paid Member Subscriptions, you can restrict all the content, such as posts and pages, WooCommerce products and Shop page, or Press forums and topics, for example. You can make them feel excluded, and create the need to be included, by sending them a message, redirecting them to a different URL, or by using a shortcode. You can find options from the screenshot above together with additional restriction options under the settings tab. Tweak them to your liking, and get the most out of your customers’ fear of missing out. When someone subscribes on your website, you want to make them feel welcome, and that they know you are happy to have them there. What is the best way to do that? Send them a welcoming email! This will help you start further conversations in the future with your newsletter campaign. Under the settings tab, you will find email options. Set up a welcoming email, like the one in the screenshot, and personalize it a little bit by displaying their name in it. This will immediately make them feel like they did right by subscribing to your website. Apart from a welcome email, you can send the email when the subscription plan is activated, expired or canceled. “Sad to see you go!” can occasionally make them change their mind about leaving. This plugin is truly a one-stop for all of your subscription needs. Apart from being able to effortlessly set everything up as we have demonstrated at this point, there are several other notable features you can benefit from. The amazing payments tab has you covered for all of your numbers. Effortlessly check the statuses of all the payments, successful or failed ones. If you are looking for a quick overview, simply head on to the Reports tab, and check how you have been doing in the last period. Another good news is that you can effortlessly export everything you find here, and share it with team members or advisors that can help you increase these numbers. You can also use the additional settings to help out your users by automatically log them in, saving them the time, and help you with earning more money by preventing account sharing. This is super important, as it will make it incredibly time-consuming for your cheating members to share their login information with others instead of having them sign up, too. If you head out the add-ons section, you will find more of very useful features you could be using to help you and your business out. There are some basic add-ons which are by themselves quite practical and effective, and there are additional, pro ones, which can turn out to be a lifesaver. Global Content Restrictions: Super useful for restricting content, in terms of both time and effort. With this feature, you can restrict content globally depending on the subscription, rather than having to go the trouble of doing the same for each post on your page individually. Discount Codes: Perfect feature to help you reward those loyal customers. Once they sign up for a specific subscription, you can say thank you with discount codes for their purchases. Email Reminders: If you are running the WooCommerce store, you want people to know about sales or upcoming events. Set up multiple email reminders that will be sent before, or even after certain events. Filter the Menu: With this feature, you will modify the front end of your webpage that the users will be seeing, depending on their subscription. Not everyone needs to have to see all the posts and options. Integrates with bbPress: This integration with the very popular forms plugin can help you out in so many ways, there is no need to even start the list. Fixed Period Membership: In case you need subscriptions to end on a specific date, regardless of when the user signed up for it, use this feature. Perfect if you are offering “special discounts” which shouldn’t last forever. Pay What You Want: Popular way of getting paid for your work. Instead of forcing them to give you a certain amount of money to get into the membership program, you can set up a variable pricing option. It makes it so much easier for them to take this step. reCaptcha: Having issues with bots spamming? Add a reCaptcha. It comes from Google, and it is very user-friendly, so no one is going to have issues with you protecting your website. Labels Edit: If you need to edit any label or any string, but don’t want to do any coding, use this add-on. It allows you to change them in just a couple of clicks. Pro add-ons can help you immensely with your payment solutions, among a couple of things. These come solely with PRO subscription plan. Recurring payments for PayPal Standard: Not being able to accept recurring payments can break your subscription business. Use this feature to accept them and increase your website’s revenue. 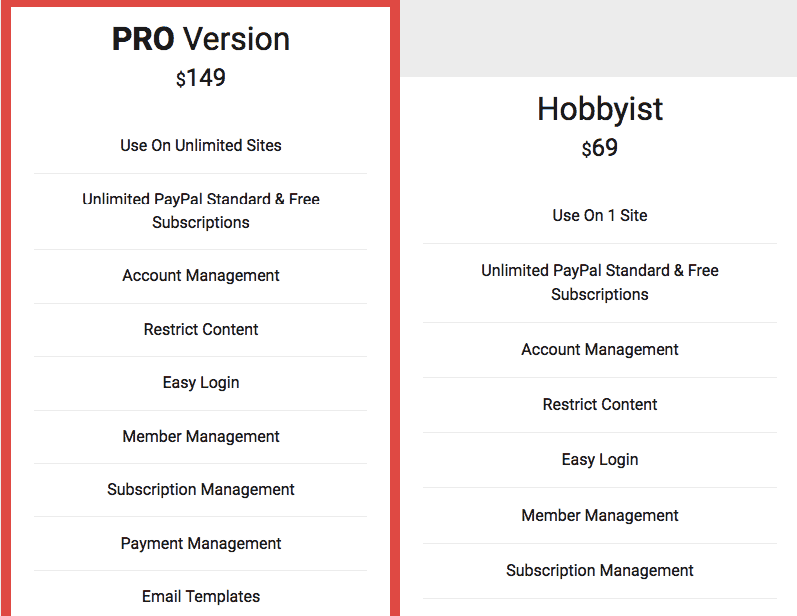 PayPal Pro and PayPal Express: This add-on will add the layer of practicality to your website, as it will enable your users to make payments without leaving your website, which is a huge time-saver for your customers. Stripe: If you are considering accepting credit card payments, why not have them directly on your website? With this Stripe add-on, you can do exactly that! Invoices: Your users will more often than not require invoices for their payments, and you might need them as well for your bookkeeper. With this add-on, you can generate invoices for the payments made on your website without breaking a sweat. Content Dripping: You do not want to give your new members all at once. With this feature, different users will get access to different content, depending on how long they have been a member on your website. Multiple Subscriptions Per User: Sometimes, your users want it all – make sure you can provide that. With this feature, you can give them the option to sign up for several subscription plans at the same time. It is safe to say that with this single plugin, which is quite easy-to-use and straightforward, you can take care of all your subscription-based needs. Take your business to the next level, start selling yourself or your products better and grow your trusted community. It is definitely a win-win situation for everyone that had signed up!